Transit • The agency says it will cut fuel costs and help reduce pollution. Scott Sommerdorf | The Salt Lake Tribune UTA has opened a new compressed natural gas fueling facility behind its HQ building, Wednesday, December 30, 2015. Scott Sommerdorf | The Salt Lake Tribune UTA has opened a new compressed natural gas fueling facility behind its HQ building. 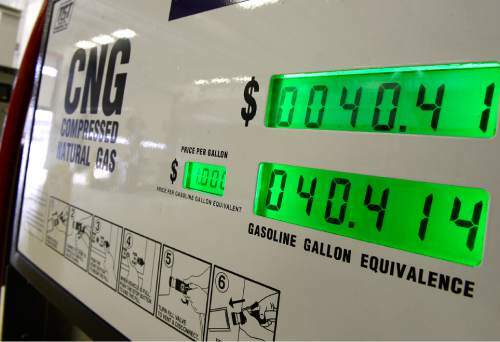 The cost to run a bus for one day on CNG is approximately $40, Wednesday, December 30, 2015. Scott Sommerdorf | The Salt Lake Tribune UTA has opened a new compressed natural gas fueling facility behind its headquarters building. Motorists drive into the covered bay and fuel up by themselves. The Utah Transit Authority just opened its first compressed natural gas (CNG) fueling facility  which the agency says should save money on fuel and help reduce pollution. For example, UTA now pays about $2.19 a gallon for diesel, says Greg Thorpe, the agency&apos;s project manager. The facility comes online as diesel and gasoline are at some of their cheapest prices in years. But CNG costs even less. "We&apos;re about $1.14 per diesel gallon equivalent" for CNG at the new facility, Thorpe said. "So it&apos;s still quite a bit cheaper" despite the recently low prices for diesel. 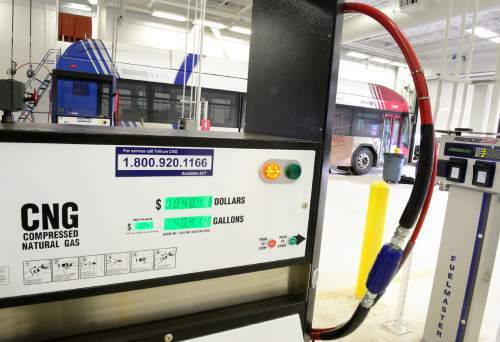 UTA expects to save $10,000 to $13,000 a year in fuel costs per CNG bus that it operates, based on the historical costs of diesel in the past, the agency said in a news release. It said natural gas prices also tend to be stable, while diesel fluctuates greatly  so more use of CNG makes it easier to budget for fuel costs. UTA has 47 CNG buses, all operating in Salt Lake County, which had been filling up at a Questar facility. Now they will be filled at the new UTA fueling station behind its headquarters in downtown Salt Lake City. UTA says the facility cost $9 million  about $6.5 million for a building and $2.5 million for a compressor station that pumps the natural gas into the buses. It said most of the cost of the facility was covered by federal grants. The facility is designed to fuel up to 250 CNG buses. UTA said it has been buying CNG buses to replace older diesel buses at the end of their usefulness. The agency has also been replacing those older diesel buses with newer "clean diesel" buses and plans to start buying electric buses. UTA says CNG buses are 85 percent cleaner than pre-2007 diesel buses and reduce an average of 17 tons of greenhouse gases per bus per year. Thorpe said the clean diesel buses reduce pollution by similar amounts. More than 65 percent of its bus fleet is now powered by CNG or clean diesel, UTA said. The new facility includes two bays for CNG fueling and future capacity to add diesel fueling and a third fueling bay. It also contains two bays for cleaning buses, a brake-inspection bay and an area for collection of money paid for fares. While UTA&apos;s current fleet requires only one compressor, another is planned for the future to handle future CNG buses. UTA said the fueling facility is the first phase of planned expansion of its Central Bus Division downtown. The current facility at 200 South and 500 West is more than 50 years old and had no room to expand for extra buses. So previously, some buses serving downtown had been stored instead at UTA&apos;s Meadowbrook Bus Division. UTA said the next phase of expansion will be to build a new bus-maintenance and -operation facility to replace the current Central Bus operations. The new facility will be named the Depot District Technology Center. It is projected to house up to 250 buses, 25 maintenance bays, space for training and bus administration offices. UTA said when the new facility is completed, it plans to sell the old Central Bus facility for development of mixed office and residential use.